In terms of property damage, 2017 was the most destructive wildfire season on record in California at the time, with a total of 9,133 fires burning 1,381,405 acres (5,590.35 km2) of land, according to the California Department of Forestry and Fire Protection, including five of the 20 most destructive wildland-urban interface fires in the state's history. Throughout 2017, the fires destroyed or damaged more than 10,000 structures in the state (destroyed 9,470, damaged 810), a higher tally than the previous nine years combined. State data showed that the large wildfires killed 47 people – 45 civilians and 2 firefighters – almost higher than the previous 10 years combined. The total property damage was surpassed by the 2018 California wildfires. Smoke from the Alamo and Whittier fires during the 2017 California fire season, on July 8, 2017. In December 2017, strong Santa Ana winds triggered a new round of wildfires, including the massive Thomas Fire in Ventura County. At the time, the Thomas Fire was California's largest modern wildfire, which has since been surpassed by the Mendocino Complex's Ranch Fire in 2018. The December 2017 fires forced over 230,000 people to evacuate, with the 6 largest fires burning over 307,900 acres (1,246 km2) and more than 1,300 structures. During the year, 5 of the 20 most destructive wildfires in the state's history burned between October and December: #1 Tubbs, #6 Nuns, #7 Thomas, #11 Atlas, and #17 Redwood Valley Complex. The wildfires collectively caused at least $18.0 billion (2018 USD) in damages, including $13.2 billion in insured losses, $3 billion in other economic losses, and $1.8 billion in fire suppression costs, making the 2017 California fires the costliest on record. The total economic cost, including fire suppression, insurance, direct and indirect economic losses, and recovery expenditures is estimated at about $180 billion (2017 USD). This number includes economic harm to the wine industry, where several wineries in Napa and Sonoma were destroyed, and where many wine grapes were severely damaged by smoke. Cal Fire spent $700 million during fiscal year 2017, far exceeding the approximately $426 million the agency had budgeted that year for fire suppression. This made 2017 the most expensive firefighting year on record in California state history. According to the National Oceanic and Atmospheric Administration, 2017 will be remembered as a year of extremes. It was the third-warmest year on record for the United States, and it was the second-hottest in California, bringing to the surface the question of long-term climate change and its contribution to the 2017 California fires. The hotter temperatures dry out vegetation, making them easier to burn, predisposing vulnerable regions like California to more wildfires in the coming decades as temperatures continue to rise and rainfall continues to decline. Photo of Northern California forest fire air pollution. Climate change is impacting the number and intensity of wildfires Nationwide, particularly in the American West. Although the number of wildfires in California has steadily been declining since 1980, the total acres burned and average acres burned is on the rise. According to Ottmar, the amount of greenhouse gases emitted from a wildfire is directly related to fuel consumption, which is the result of area burned, burning period, fuel characteristics, and fire behavior. These factors lead to the production of greenhouse gases, fine particulate matter emission, black carbon emission, carbon dioxide and monoxide production, as well as other trace gases. The amount and type of emissions resulting from wildfires is dependent on the model used, as demonstrated by Larkin et al. in their comparison of four emissions inventories created for the contiguous United States (CONUS). California’s forests are huge carbon reservoirs for the state. The forests and vegetation of state wild lands stored an estimated 850 million tons of carbon in 2010, and accounted for approximately 69 million tons of carbon emitted between 2001 and 2010. Annual carbon losses from forests and wild lands in California represent as much as 5 to 7 percent of state carbon emissions from all sectors between 2001 and 2010, according to the study. Wildfires in Southern California burn through fuel sources such as vegetation, gasoline, coal, and create a nasty mixture of aerosols and gases into the atmosphere- include hydrocarbons, nitrogen oxides, and carbon monoxide. Carbon monoxide contributes to reactions that produce ground-level ozone, a harmful pollutant. It can also make breathing difficult to dangerous when trapped near the ground. A 2014 study by Mark Jacobson showed evidence that the burning of biomass like trees, plants, and grass—either by accident or deliberately creates 18 percent of all human-caused carbon emissions (nearly 8.5 billion tons each year), and accounts for 5-10 percent of all air pollution deaths worldwide, or about 250,000 people annually. According to Jacobson, biomass burning has other impacts that increase warming in the atmosphere, beyond just producing greenhouse gas emissions. The process also creates tiny bits of soot, called black carbon, and traces of harmful substances, known as brown carbon, which together cause more global warming per unit weight than other human-associated carbon sources. California is one of the few jurisdictions in the world to set mandatory greenhouse gas emissions targets. A 2015 study by the National Park Service and UC Berkeley that quantified the amount of carbon stored and released through California forests and wild lands found that wildfires and deforestation are contributing more than expected to the state’s greenhouse gas emissions. These data and the most recent wildfires of 2017 could have dire implications for California’s efforts to meet goals mandated by the state Global Warming Solutions Act, or AB 32, to reduce greenhouse gas emissions to 1990 levels by the year 2020. The bill, which passed in 2006, assumed no net emissions for wild land ecosystems by 2020. Maintenance of balance in carbon storage and emissions is disrupted by wildfires which wipe out vegetation that naturally removes carbon from the atmosphere, exacerbating climate change. 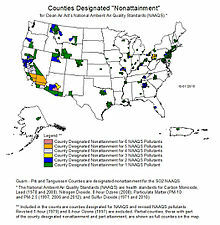 Map of counties across US who are not in attainment of EPA's NAAQS. You can see that Southern California has exceeded the standards for 5 pollutants. In addition to the tremendous economic loss and danger to human lives, wildfires also play a huge part in significantly worsening air quality in both local and downwind regions, causing more long-term human health problems. Emissions from wildfires transported or nearby urban areas can be a sporadic but significant contribution to urban air pollution. For example, the Environmental Protection Agency's National Emission Inventory reported that 27% of carbon monoxide and 17% of fine particulate matter (below 2.5μm) emissions throughout the Western states was due to wildfires. Smoke generated from wildfires from thousands of miles away can impact air quality in urban areas, and the air pollution generated from the burned biomass can cause these same urban areas to exceed the EPA's National Ambient Air Quality Standards (NAAQS). In addition, increased air pollution due to wildfires can exacerbate pre-existing cardiovascular and respiratory conditions, such as asthma or COPD, and can impair lung function. Children - Because children's lungs are still developing, they are more susceptible to acute and chronic symptoms due to air pollution. As such, children have higher rates of asthma than adults, which can be further aggravated by particulate pollution from wildfire smoke. Additionally, children tend to spend more time running and playing outside than adults which can increase their vulnerability to all types of air pollution. Older adults - Older adults have a higher prevalence of pre-existing cardiovascular and respiratory illness which can be exacerbated by wildfire particulate pollution. Additionally, immune function declines with age which further increases vulnerability of adverse health effects. Numerous studies have shown that hospital admissions of the elderly for cardiovascular and respiratory symptoms increase during and after wildfires. Those with pre-existing cardiovascular or respiratory conditions - Wildfire smoke can worsen symptoms of pre-existing cardiovascular and respiratory conditions causing increased morbidity and mortality among this population. Pregnant women - Exposure to particulate matter pollution by pregnant women has been linked to decreased birth weights and other adverse birth outcomes. Those of lower socioeconomic status - Those of lower SES show higher prevalence rates of asthma and other diseases, which can increase risk of severe symptoms and hospitalization due to particulate matter pollution from wildfires. Limiting exposure to wildfire smoke is important for prevention of smoke-related illnesses. Staying indoors, reducing physical activity, using air filters and air conditioners, and reducing other forms of indoor air pollution such as smoking and use of propane and wood burning stoves are strategies to limit exposure to wildfire smoke. In addition, checking the news and local Air Quality Index reports can be useful for information regarding pollution levels and public health safety recommendations for areas impacted by wildfires and wildfire smoke. Although climate and weather patterns are key drivers of wildfire occurrence across California, humans are currently responsibly for around 95% of wildfires in the state. Many of California's communities are built in or near areas of natural vegetation that is prone to fires. In San Diego alone, 3 out of every 4 homes are built within risk-prone areas. There are a multitude of predictor models that attempt to understand the scope of wildfire activity over the coming century with most agreeing that climate change will have a huge impact on wildfire activity changes, with an estimated increase in total area burned between 15 and 50 percent. Ongoing expansion of communities into fire-prone areas greatly impacts current models developed and must be studied further in order to discern the overall impact on structural damage and lives impacted. California occupies a broad climate space, spanning alpine zones, temperate rain forests, ecosystems, and deserts. In addition, the state is the most populous in the country, meaning that these ever-growing communities will have a large impact on whether or not California will increase or decrease the amount of fires over the course of the next century. Electrical lines and equipment have consistently been among the three major causes of California wildfires in recent years. They were the leading cause of fires that burned more acres in California than any other cause in 2015. Although it is very difficult to predict future conditions for wildfires in California, several studies have been published in attempt to show the significant impact wildfires will have across the state and the Western United States. Since it is a mountainous and populous state, California has a unique set of both geographical and meteorological parameters associated with wildfires. Projections of future wildfire activity in southern California are sparse and the few that have been completed are contradictory. In addition, projection models differ based on the general circulation models (GCMs) used to estimate changes in wildfire activity. However, a recent study conducted in 2014 by Yue et. al attempted to better estimate and avoid the discrepancies in past wildfire activity projection models. In this study, researchers found that wildfire activity will increase in southwestern California and the Sierra Nevada in coming decades as a consequence of increasing surface temperature. In 2014, a study found a human fingerprint in growing California wildfire risks. The paper is titled “Extreme fire season in California: A glimpse into the future?” It was published as the second chapter of “Explaining Extreme Events of 2014” by the American Meteorological Society. The authors also projected increases in the drought index, the area under extreme threat of fires, and the days of fire danger, stating that, "The increase in extreme fire risk is expected within the coming decade to exceed that of natural variability and this serves as an indication that anthropogenic climate warming will likely play a significant role in influence California’s fire season." Image of lightning during a thunderstorm. According to Romps et. al, as annual temperatures and precipitation activity changes due to global warming, there will be increases in lightning strikes across the United States. Per °C of increased temperature due to global warming, there will be a mean increase in lightning strikes of 12 ± 5 percent. This increase in lightning strikes will impact areas like California that have already been impacted by intense wildfire activity. These increases in lightning strikes will increase wildfires caused by natural causes instead of man-made wildfires in less inhabited regions, leading to fires that are difficult for firefighters to reach, leading to larger, more destructive burn areas. Photo of the Colby fire in Angeles National Forest. In 2017, a study projected that the single largest threat to Los Angeles County hospitals related to climate change is the direct impacts resulting from the expected increase in wildfires. In Los Angeles County, 34% of hospitals are within one mile of very high fire hazard severity zones, with 24% of these hospitals having a disproportionate share of patient load and 12% impacted by health care shortages. In addition, one of the hospitals studied was in danger of sea-coastal flooding due to the effects of climate change. This issue will become a greater obstacle as sea levels rise due to increase annual temperatures. As a consequence of further global warming, it is projected that there will be an increase in risk due to climate-driven wildfires in the coming decades. Because of warming, frequent droughts, and the legacy of past land management and expansion of residential areas, both people and the ecology with which we coexist are more vulnerable to wildfires. Wildfire activity is closely tied to temperature and drought over time. Globally, the length of the fire season increased by nearly 19% from 1979 to 2013, with significantly longer seasons in the western states. Since 1985, more than 50% of the wildfire area burned in the western United States can be attributed to anthropogenic climate change. In addition, due to human fire suppression methods, there is a build of fuels in some ecosystems, making them more vulnerable to wildfires. There is greater risk of fires occurring in denser, dryer forests where histrionically these fires occurred in low-density areas. Lastly, with increases in human population, we have expanded out communities into areas that are at higher risk to wildfire threat, making these same populations more vulnerable to structural damage and death due to wildfires. Since 1990, the average annual number of homes lost to wildfires has increased by 300%. Almost 900,000 of western US residences are currently in high risk wildfire areas with nearly 35% of wildfires in California starting within this high risk areas. Thus, policies must be generated that allow for adaptation to increased wildfire risk and reduce further vulnerability in these high risk areas. This section contains a maps of the locations and burn areas of the fires that occurred during the largest outbreaks of the season. The burn areas of some major fires are included in some of the maps. 2017 California wildfires. Each dot shows the location (but not the extent) of a satellite-detected heat source. Click to enlarge. The 2017 Northern California wildfires, from January 1 to October 11. Below is a list of all fires that exceeded 1,000 acres (400 ha) during the 2017 California wildfire season, as well as the fires that caused significant damage. The information is taken from CAL FIRE's list of large fires, and other sources where indicated. During the month of October, a series of wildfires broke out throughout Napa, Lake, Sonoma, Mendocino, and Butte counties during severe fire weather conditions, effectively leading to a major red flag warning from much of the northern California area. In the extreme conditions, shortly after the fires ignited, they rapidly grew to become massive conflagrations spanning from 1,000 to well over 20,000 acres apart within a single day. In addition, the fires have destroyed an estimated 8,900+ structures, and killed at least 44 people. The fires burned over 245,000 acres (99,148 ha) of land, and forced over 20,000 people to evacuate. Multiple wildfires ignited in December across Los Angeles, San Bernardino, Ventura, San Diego, Riverside, Santa Barbara Counties. The fires were exacerbated by unusually powerful and long-lasting Santa Ana winds, as well as large amounts of dry vegetation grown, due to large amounts of precipitation earlier in the year. The fires burned over 307,900 acres (1,246 km2), and caused traffic disruptions, school closures, hazardous air conditions, and massive power outages. California Governor Jerry Brown declared a state of emergency in Ventura and Los Angeles Counties, and Los Angeles Mayor Eric Garcetti declared a state of emergency for the city. The largest fire was the Thomas Fire, which grew to 281,893 acres, becoming California's largest modern wildfire at the time, since surpassed by the Mendocino Complex's Ranch Fire in 2018. ^ a b "2017 Fire Statistics". CAL FIRE. Retrieved April 22, 2017. ^ Dale Kasler (December 8, 2017). "Wine country wildfire costs now top $9 billion, costliest in California history". The Sacramento Bee. Retrieved December 11, 2017. ^ Jaclyn Cosgrove; Alejandra Reyes-Velarde (September 8, 2018). "Wildfires have charred more than 1 million acres in California this year — and fire season is far from over". Retrieved September 11, 2018. ^ a b c California, State of. "CAL FIRE - Home". www.fire.ca.gov. Retrieved March 30, 2018. ^ Saunders, Doug (April 7, 2016). "How will rainy winter affect fire season? More summer grass fires, officials predict". The Press-Enterprise. The Press-Enterprise. Retrieved April 5, 2017. ^ a b c Madison Park and Cheri Mossberg (December 5, 2017). "'Fire is still out of control' as massive blaze forces thousands to evacuate". CNN. Retrieved December 5, 2017. ^ Susan Abram (December 6, 2017). "Wildfires raging in Southern California cap most destructive season in state history. Here's why it's so bad". Los Angeles Daily News. Retrieved December 6, 2017. ^ "Southern California wildfires still burning as Donald Trump issues federal emergency declaration". ABC News. December 9, 2017. Retrieved December 11, 2017. ^ "Top 20 Most Destructive California Wildfires" (PDF). CalFire. December 21, 2017. Retrieved December 28, 2017. ^ "AccuWeather predicts 2017 California wildfire season cost to rise to $180 billion". AccuWeather. December 8, 2017. Retrieved December 11, 2017. ^ Brian Frank; Aaron Mendelson (January 12, 2018). "Thomas Fire fully contained, as firefighting costs set new record". 89.3 KPCC. Retrieved May 26, 2018. ^ Keeley, Jon; Syphard, Alexandra (2017). "Different historical fire–climate patterns in California". International Journal of Wildland Fire. 26 (4): 253–268. doi:10.1071/WF16102. ^ Tedford, Daniel (September 14, 2017). "Over the last 40 years, there is a surprising trend with California wildfires". Orange County Register. Retrieved March 29, 2018. ^ Ottmar, Roger (2014). "Wildland fire emissions, carbon, and climate: Modeling fuel consumption". Forest Ecology and Management. 317: 41–50. doi:10.1016/j.foreco.2013.06.010. ^ Hao, Wei Min; Larkin, Narasimhan (2014). "Wildland fire emissions, carbon, and climate: Wildland fire detection and burned area in the United States". Forest Ecology and Management. 317: 20–25. doi:10.1016/j.foreco.2013.09.029. ^ Urbanski, Shawn; Hao, Wei Min; Baker, Stephen (2009). Developments in Environmental Science (PDF). Chapter 4 - Chemical Composition of Wildland Fire Emissions: Elsevier B.V. pp. 79–107. ^ Larkin, Narasimhan; Raffuse, Sean; Strand, Tara (2014). "Wildland fire emissions, carbon, and climate: U.S. emissions inventories". Forest Ecology and Management. 317: 61–69. doi:10.1016/j.foreco.2013.09.012. ^ "Wildfires And 'Biomass Burning' Are Bigger Climate Change Threats Than Previously Thought, Stanford Study Says". International Business Times. August 1, 2014. Retrieved March 30, 2018. ^ "California Wildfire Emissions : Image of the Day". earthobservatory.nasa.gov. December 11, 2017. Retrieved March 30, 2018. ^ a b Jacobson, Mark Z. (July 27, 2014). "Effects of biomass burning on climate, accounting for heat and moisture fluxes, black and brown carbon, and cloud absorption effects". Journal of Geophysical Research: Atmospheres. 119 (14): 8980–9002. doi:10.1002/2014jd021861. ISSN 2169-8996. ^ "Wildfires cause nearly a fifth of carbon emissions". Mother Jones. Retrieved March 30, 2018. ^ "Wildfires emit more greenhouse gases than assumed in state climate targets". Berkeley News. April 15, 2015. Retrieved March 30, 2018. ^ Board, California Air Resources. "Assembly Bill 32 - California Global Warming Solutions Act". www.arb.ca.gov. Retrieved March 30, 2018. ^ a b c Yue, Xu; Mickley, Loretta J.; Logan, Jennifer A. (October 1, 2014). "Projection of wildfire activity in southern California in the mid-twenty-first century". Climate Dynamics. 43 (7–8): 1973–1991. doi:10.1007/s00382-013-2022-3. ISSN 0930-7575. PMC 4204739. PMID 25346575. ^ Haikerwal, Anjali; Akram, Muhammad; Monaco, Anthony Del; Smith, Karen; Sim, Malcolm R.; Meyer, Mick; Tonkin, Andrew M.; Abramson, Michael J.; Dennekamp, Martine (July 28, 2015). "Impact of Fine Particulate Matter (PM2.5) Exposure During Wildfires on Cardiovascular Health Outcomes". Journal of the American Heart Association. 4 (7): e001653. doi:10.1161/JAHA.114.001653. ISSN 2047-9980. PMC 4608063. PMID 26178402. ^ Schwartz, Joel (April 1, 2004). "Air Pollution and Children's Health". Pediatrics. 113 (Supplement 3): 1037–1043. ISSN 0031-4005. PMID 15060197. ^ "Vital Signs: Asthma Prevalence, Disease Characteristics, and Self-Management Education --- United States, 2001--2009". www.cdc.gov. Retrieved March 30, 2018. ^ Le, George E.; Breysse, Patrick N.; McDermott, Aidan; Eftim, Sorina E.; Geyh, Alison; Berman, Jesse D.; Curriero, Frank C. (May 20, 2014). "Canadian Forest Fires and the Effects of Long-Range Transboundary Air Pollution on Hospitalizations among the Elderly". ISPRS International Journal of Geo-Information. 3 (2): 713–731. doi:10.3390/ijgi3020713. ^ "How Smoke from Fires Can Affect Your Health". airnow.gov. Retrieved March 30, 2018. ^ Kessler, Rebecca (2012). "Environmental Health Perspectives – Followup in Southern California: Decreased Birth Weight following Prenatal Wildfire Smoke Exposure". Environmental Health Perspectives. 120 (9): A362. doi:10.1289/ehp.120-a362b. PMC 3440126. PMID 23487842. Retrieved March 30, 2018. ^ Almqvist, C.; Pershagen, G.; Wickman, M. (May 2005). "Low socioeconomic status as a risk factor for asthma, rhinitis and sensitization at 4 years in a birth cohort". Clinical & Experimental Allergy. 35 (5): 612–618. doi:10.1111/j.1365-2222.2005.02243.x. ISSN 0954-7894. PMID 15898983. ^ "Wildfire Smoke|Wildfires". www.cdc.gov. November 16, 2017. Retrieved March 30, 2018. ^ Mann, Michael L.; Batllori, Enric; Moritz, Max A.; Waller, Eric K.; Berck, Peter; Flint, Alan L.; Flint, Lorraine E.; Dolfi, Emmalee (April 28, 2016). "Incorporating Anthropogenic Influences into Fire Probability Models: Effects of Human Activity and Climate Change on Fire Activity in California". PLOS ONE. 11 (4): e0153589. doi:10.1371/journal.pone.0153589. ISSN 1932-6203. PMC 4849771. PMID 27124597. ^ Atleework, Kendra (May 25, 2018). "Power Lines Are Burning the West". The Atlantic. Retrieved November 29, 2018. ^ "New research finds that global warming is intensifying wildfires". December 3, 2015. Retrieved December 31, 2017. ^ Romps, David M.; Seeley, Jacob T.; Vollaro, David; Molinari, John (November 14, 2014). "Projected increase in lightning strikes in the United States due to global warming". Science. 346 (6211): 851–854. doi:10.1126/science.1259100. ISSN 0036-8075. PMID 25395536. ^ Adelaine, Sabrina A.; Sato, Mizuki; Jin, Yufang; Godwin, Hilary (October 2017). "An Assessment of Climate Change Impacts on Los Angeles (California USA) Hospitals, Wildfires Highest Priority". Prehospital and Disaster Medicine. 32 (5): 556–562. doi:10.1017/S1049023X17006586. ISSN 1945-1938. PMID 28606202. ^ Schoennagel, Tania; Balch, Jennifer K.; Brenkert-Smith, Hannah; Dennison, Philip E.; Harvey, Brian J.; Krawchuk, Meg A.; Mietkiewicz, Nathan; Morgan, Penelope; Moritz, Max A. (May 2, 2017). "Adapt to more wildfire in western North American forests as climate changes". Proceedings of the National Academy of Sciences. 114 (18): 4582–4590. doi:10.1073/pnas.1617464114. PMC 5422781. PMID 28416662. ^ "Statistics and Events". CAL FIRE. March 29, 2017. Retrieved December 10, 2018. ^ "Jayne Fire". CAL FIRE. Retrieved May 26, 2018. ^ "Opera Fire". CAL FIRE. Retrieved May 26, 2018. ^ "Elm Fire". CAL FIRE. Retrieved May 26, 2018. ^ "Gate Fire". CAL FIRE. Retrieved May 26, 2018. ^ "Oakwood Fire". CAL FIRE. Retrieved May 26, 2018. ^ "Highway Fire". InciWeb. Retrieved June 18, 2016. ^ "Holcomb Fire". InciWeb. Retrieved June 19, 2017. ^ "Schaeffer Fire". InciWeb. Retrieved June 25, 2017. ^ "Salmon August Complex Fire". InciWeb. December 8, 2017. Retrieved December 9, 2017. ^ "Salmon-August Complex". CalFire. October 6, 2017. Retrieved May 26, 2018. ^ "Manzanita Fire". CAL FIRE. Retrieved May 26, 2018. ^ "Hill Fire". CAL FIRE. Retrieved May 26, 2018. ^ "Winters Fire". CAL FIRE. Retrieved May 26, 2018. ^ "Alamo Fire". CAL FIRE. Retrieved May 26, 2018. ^ "Wall Fire". CAL FIRE. Retrieved May 26, 2018. ^ "Whittier Fire". InciWeb. Retrieved July 8, 2017. ^ "Parkfield Fire". CAL FIRE. Retrieved May 26, 2018. ^ "Garza Fire". CAL FIRE. Retrieved May 26, 2018. ^ "Long Valley Fire". InciWeb. Retrieved July 11, 2017. ^ "Detwiler Fire". CAL FIRE. Retrieved May 26, 2018. ^ "Modoc July Complex Fire". InciWeb. Retrieved July 25, 2017. ^ "Orleans Complex Fire". InciWeb. Retrieved October 9, 2017. ^ "Empire Fire". InciWeb. Retrieved August 1, 2017. ^ "Parker 2 Fire". InciWeb. Retrieved August 13, 2017. ^ "Young Fire". InciWeb. August 28, 2017. Retrieved August 28, 2017. ^ "South Fork Fire". InciWeb. November 27, 2017. Retrieved December 9, 2017. ^ "Blaine Fire". CAL FIRE. Retrieved August 13, 2017. ^ "Eclipse Complex Fire". InciWeb. Retrieved August 16, 2017. ^ "Pier Fire". InciWeb. Retrieved October 9, 2017. ^ "Railroad Fire". InciWeb. October 24, 2017. Retrieved December 6, 2017. ^ "Pier Fire". CAL FIRE. Retrieved May 26, 2018. ^ "Mud Fire". InciWeb. Retrieved August 29, 2017. ^ "Slinkard Fire". InciWeb. September 12, 2017. Retrieved December 6, 2017. ^ "Helena Fire". InciWeb. Retrieved November 28, 2017. ^ "La Tuna fire 100 percent contained, LAFD says". September 9, 2017. ^ "Palmer Fire". CAL FIRE. Retrieved May 26, 2018. ^ "Mission Fire". InciWeb. Retrieved September 3, 2017. ^ "Buck Fire". InciWeb. Retrieved November 28, 2017. ^ "Lion Fire". InciWeb. December 2, 2017. Retrieved December 14, 2017. ^ "Canyon Fire". InciWeb. Retrieved September 12, 2017. ^ "Cherokee Fire". CAL FIRE. Retrieved May 26, 2018. ^ "Atlas Fire". CAL FIRE. Retrieved May 26, 2018. ^ "Tubbs Fire". CAL FIRE. Retrieved October 9, 2017. ^ "Nuns Fire". CAL FIRE. Retrieved May 26, 2018. ^ "Redwood Fire". CAL FIRE. Retrieved May 26, 2018. ^ Peter Fimrite & Kurtis Alexander, 17-year-old dies of burns, becomes 43rd victim of California wildfires, San Francisco Chronicle (October 30, 2017). ^ "La Porte Fire". CAL FIRE. Retrieved May 26, 2018. ^ "Cascade Fire". CAL FIRE. Retrieved May 26, 2018. ^ "Sulphur Fire". CAL FIRE. Retrieved May 26, 2018. ^ "Canyon 2 Fire". CAL FIRE. Retrieved May 26, 2018. ^ a b "California Statewide Fire Summary". CAL FIRE. State of California. Retrieved October 30, 2017. ^ "Pocket Fire". CAL FIRE. Retrieved May 26, 2018. ^ "Lobo Fire". InciWeb. Retrieved October 9, 2017. ^ "Bear Fire". CAL FIRE. Retrieved May 26, 2018. ^ "Buffalo Fire". CAL FIRE. November 14, 2017. Retrieved December 7, 2017. ^ "Wildomar Fire". CAL FIRE. Retrieved May 26, 2018. ^ "Thomas Fire". CalFire. March 28, 2018. Retrieved May 26, 2018. ^ Eliott C. McLaughlin; Nicole Chavez; Paul Vercammen; Steve Aimasy (December 8, 2017). "California fires: Two people burned in new blaze". CNN. Retrieved December 8, 2017. ^ Shelby Grad (December 5, 2017). "Fast-moving Creek fire threatens homes in Sylmar area, burns 1,000 acres". Retrieved December 5, 2017. ^ "1,000-acre brush fire burning in Kagel Canyon near Sylmar". ABC7.com. December 5, 2017. Retrieved December 5, 2017. ^ Valenzuela, Beatriz E. (December 6, 2017). "Little Mountain fire in San Bernardino is 50 percent contained; firefighters fear tonight's winds". San Bernardino Sun. Retrieved December 6, 2017. ^ Serna, Joseph; Reyes-Velarde, Alejandra (December 5, 2017). "3 burned in wind-driven fire that's growing in San Bernardino County, officials say". Los Angeles Times. ISSN 0458-3035. Retrieved December 6, 2017. ^ Hagen, Ryan; Whitehead, Brian (December 5, 2017). "Little Mountain fire in San Bernardino forces evacuations, freeway closures". The Press-Enterprise. Retrieved December 6, 2017. ^ "Little Mountain Fire". CalFire. December 7, 2017. Retrieved May 26, 2018. ^ Margaret Stewart (December 9, 2017). "Skirball Fire Update". Los Angeles Fire Department. Retrieved December 9, 2017. ^ April Newman (December 7, 2017). "Liberty Fire Incident Information Fact Sheet". Riverside County Fire Department. Retrieved December 7, 2017. ^ "Liberty Fire Alert". Murrieta.gov. December 9, 2017. Retrieved December 10, 2017. ^ Ellis, Ralph; Sterling, Joe; Murphy, Paul; McLaughlin, Elliot (October 9, 2017). "Fast-moving wildfires kill 10, spur evacuations in Northern California". CNN. CNN. Retrieved October 9, 2017. ^ Emslie, Alex (November 29, 2017). "October Fires' 44th Victim: A Creative, Globetrotting Engineer With 'the Kindest Heart'". KQED News. Retrieved December 1, 2017. ^ Allen, Karma (October 11, 2017). "At least 21 dead in horrific California wildfires, hundreds missing". ABC News. Retrieved October 11, 2017. ^ Kohli, Sonali; Sahagun, Louis; John, Paige St; Agrawal, Nina; Megerian, Chris (October 12, 2017). "Death toll climbs to 29 as crews begin grim search among ashes of wine country fires". Los Angeles Times. ISSN 0458-3035. Retrieved October 12, 2017. ^ Yee, Christopher (December 6, 2017). "State of emergency declared for Los Angeles County as Creek, Rye fires continue to burn". The Mercury News. Retrieved December 6, 2017. Wikimedia Commons has media related to 2017 wildfires in California.